What will happen to Polish shops in the UK? Jump to media player An entrepreneur who has built up three Polish delis in Cambridgeshire explains her fears about the referendum result. Brexit: Just how divided is Britain? Jump to media player To what extent does the referendum result show a divided Britain? We explore the data. 'Millennials' send message to EU leaders Jump to media player "Millennials" in Brussels - people who reached adulthood at the turn of the century - send their personal message to Europe's leaders, after the UK voted to leave the European Union. The Schengen pizza Jump to media player What is Schengen? We set out to explain it using a very European dish: the pizza. The EU budget smoothie Jump to media player After blending some fruits and vegetables we figured out how the EU put its budget together. Josh Coombes is a hairdresser with a huge salon: the streets of London. 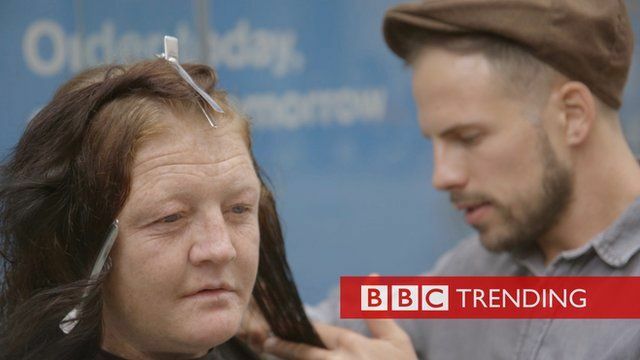 The 29-year-old has been giving free haircuts to homeless people for the past year. Photos of the results are posted on an Instagram account which has thousands of followers. It's part of an campaign by Josh and friends Matt Spracklen and Dave Burt, which is using the the hashtag #DoSomethingforNothing, to encourage people to help others, any way they can. For more videos subscribe to BBC Trending's YouTube channel. Or find us on Facebook. Go to next video: What will happen to Polish shops in the UK?